The rk and saman verses, the chandas, the Purana along with the Yajus formulae, all sprang from the remainder of the sacrificial food, (as also) the gods that resort to heaven. He changed his place and went over to great direction, and Itihasa and Purana, gathas, verses in praise of heroes followed in going over. The progeny of Dharma by the daughters of Daksha were as follows: by Sraddhá (devotion) he had Kama (desire); by Lakshmí (wealth, prosperity), was born Darpa (pride); by Dhriti (courage), the progeny was Niyama (precept); by Tusht́i (inner comfort), Santosha (contentment); by Pusht́i (opulence), the progeny was Lobha (cupidity, greed); by Medhá (wisdom, experience), Sruta (sacred tradition); by Kriyá (hard work, labour), the progeny were Dańd́a, Naya, and Vinaya (justice, politics, and education); by Buddhi (intellect), Bodha (understanding); by Lajjá (shame, humility), Vinaya (good behaviour); by Vapu (body, strength), Vyavasaya (perseverance). 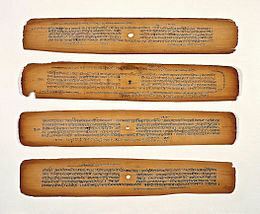 Shanti (peace) gave birth to Kshama (forgiveness); Siddhi (excellence) to Sukha (enjoyment); and Kírtti (glorious speech) gave birth to Yasha (reputation). These were the sons of Dharma; one of whom, Kama (love, emotional fulfillment) had baby Hersha (joy) by his wife Nandi (delight). The wife of Adharma (vice, wrong, evil) was Hinsá (violence), on whom he begot a son Anrita (falsehood), and a daughter Nikriti (immorality): they intermarried, and had two sons, Bhaya (fear) and Naraka (hell); and twins to them, two daughters, Máyá (deceit) and Vedaná (torture), who became their wives. The son of Bhaya (fear) and Máyá (deceit) was the destroyer of living creatures, or Mrityu (death); and Dukha (pain) was the offspring of Naraka (hell) and Vedaná (torture). The children of Mrityu were Vyádhi (disease), Jará (decay), Soka (sorrow), Trishńa (greediness), and Krodha (wrath). These are all called the inflictors of misery, and are characterised as the progeny of Vice (Adharma). They are all without wives, without posterity, without the faculty to procreate; they perpetually operate as causes of the destruction of this world. On the contrary, Daksha and the other Rishis, the elders of mankind, tend perpetually to influence its renovation: whilst the Manus and their sons, the heroes endowed with mighty power, and treading in the path of truth, as constantly contribute to its preservation. ^ Barbara Holdrege (2012). Hananya Goodman (ed.). Between Jerusalem and Benares: Comparative Studies in Judaism and Hinduism. State University of New York Press. p. 110. ISBN 978-1-4384-0437-0. Gregory Bailey (2003). Arvind Sharma (ed.). The Study of Hinduism (Chapter: The Puranas). University of South Carolina Press. ISBN 978-1-57003-449-7. Rao, Velcheru Narayana (1993). "Purana as Brahminic Ideology". In Doniger Wendy (ed.). Purana Perennis: Reciprocity and Transformation in Hindu and Jaina Texts. Albany: State University of New York Press. ISBN 0-7914-1381-0.